Prague Castle is in fact, more like a walled, medieval village, rather than one singular castle. 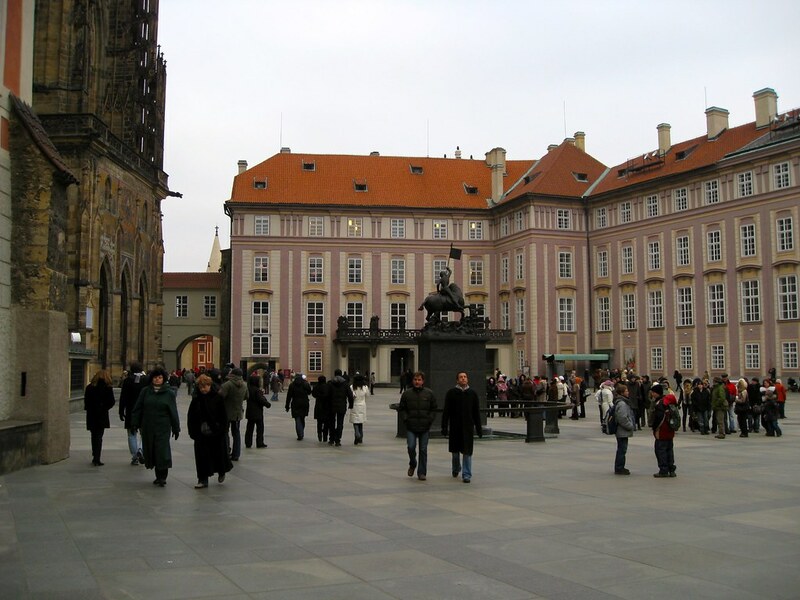 Inside these walls are some of Prague's most famous architectural masterpieces. Combined into a compound, this mini-city is now known as "Prague Castle". Prague Castle takes up over 70,000 square metres. The various buildings inside date as far back as the 9th century. Hidden within these walls, seemingly ubiquitous townhomes, storefronts and little passageways have been left to the passage of time, almost untouched from the modern world. This timeless atmosphere is a big drawn for tourists wanted to escape and each year more than 1.8 million footsteps tread on these cobblestones. The earliest architectural research shows that the Castle was founded around 880 by Prince Bořivoj. The castle became home to Bohemian Kings and Queens and today is the official residence of the President of the Czech Republic. The large, wooden walls that surrounded the castle when it was first constructed were built as a defense against incoming invaders and enemies. Over the years, wooden walls were replaced with stone, and many of the original stones are still standing today. 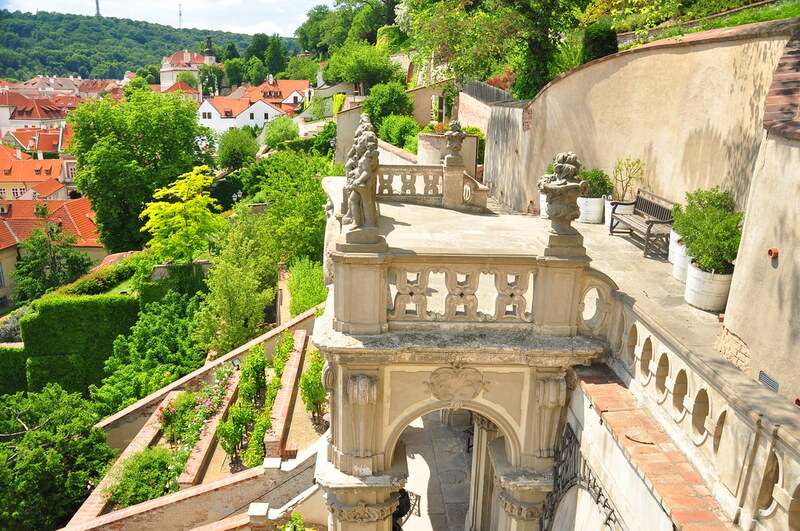 Despite these countermeasures, Prague suffered many, many wars over the years, and much of the castle complex has been destroyed and rebuilt in the original style. Walking through the walled city, you'll come upon three different courtyards, each serving their different purpose. Some were meant for the nobility, others marketplaces for the common folk. Since the castle was home not only to royals but their guards, alchemists, servants and craftsmen, this resulted in a hodgepodge of architectural styles. Some are grand structures, others simple homes for the working class. The castle opens are early as 7am throughout the year, and if you're able to get up this early, this is the best time to explore the grounds. Crossing the Charles Bridge to get to the castle is always a challenge since the bridge is usually rammed with tourists and street vendors. Going in early not only means you'll have the bridge to yourself, but you also get to be surrounded by that iconic sunrise along the Vltava river. To reach the Castle, you can take the tram to either Královský letohrádek, Pražský hrad, or Pohořelec station. From either of these stops it is only a 5-10 min walk into the entrance of the Castle. For the purpose of this tour, we're going to get off at the Pohorelec stop. If it's the summertime, consider getting off at the tram stop for the Summer Royal Palace. This way, you have the opportunities to walk through the lush, manicured gardens of the royal palace on your way into castle's labyrinth. Exploring the complex can take a whole day or two if you want to go inside every building and visit every museum but if you'd rather just wander the streets most the Castle can be explored in half a day. Upon arriving at the castle gates from the tram stop, you can stop at the ticket booth and buy your ticket to access the interior of various famous buildings. But before you do, know that you do DO NOT need to buy a ticket simply to walk around Prague Castle. What the ticket is for is access to the Cathedral, Residence and exhibitions. Many tourists don't know this, and for most of us who are on a schedule, and don't need to go inside the museums, there's no reason to pay extra for things you don't want to see. There are all sorts of different "circuit" tickets available, all which offer access to various parts of the castle. This can seem daunting and confusing at first, and I think a lot of tourists go for the most expensive one thinking that's the easiest way to see it all. Circuit A will cost you CZK 350 ($15 USD), and Circuit B will cost you CZK 250 ($10 USD). For most visitors, the 'Circuit B' ticket is actually your best choice. It gives you access to St. Vitus Cathedral, Old Royal Palace, St. George's Basilica, and Golden Lane with the Daliborka Tower. It won't give you access to The Story of Prague Castle or the Powder Tower and Rosenberg Palace, but I don't think these are worth your time for a first time visitor. At the front gate, the first stop on our tour, you'll see the castle guards standing tall within their grey and white striped booths. There is a changing of the guard ceremony every hour so try to arrange your arrival in time to catch this short but entertaining ceremony. As you pass through the gate, be sure to look up at Ignaz Frantisek Platzer’s stone giants who stand atop the columns. They hold in their hand's giant clubs which they are swinging wildly at the enemies who are cowered at their feet. A show to any visitor entering the palace grounds of the might of the people of Prague. Inside the first gate, you can see in front of you the 17th century Matthias Gate, designed by Italian artist Giovanni Maria Flippi. 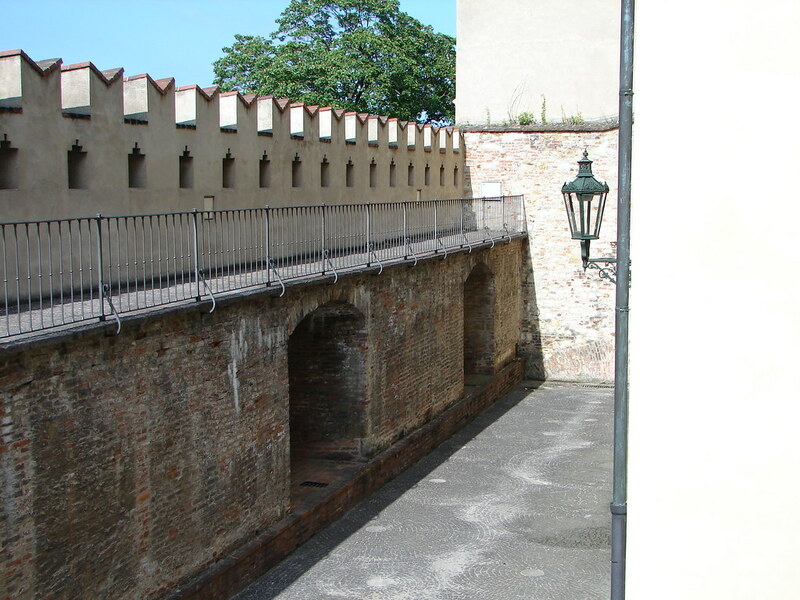 This gate once stood freely, but eventually, the Maria Theresa extension was built up around it to connect the various residence buildings together. Pass through this gate, and you’ll come upon a gorgeous stone fountain from 1686. 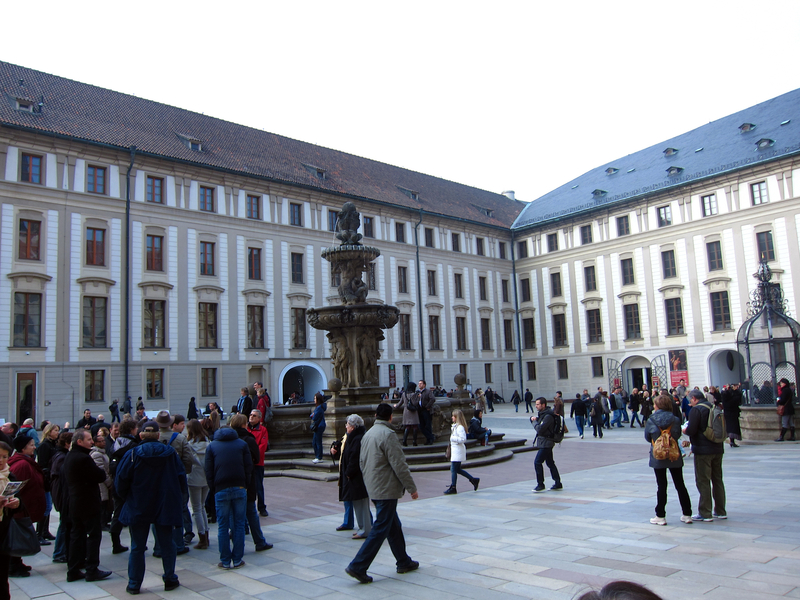 The fountain is set beside the largest well which was used for all the citizens of Prague Castle. The old well can be seen under a thick, black, brought-iron cage. Legend has it that the well was guarded by the water sprite Pakit, who protected the city's water from evil demons. Through the first courtyard, you're lead into the second courtyard, where you'll immediately be struck with the image of St. Vitus Cathedral, looming overhead. 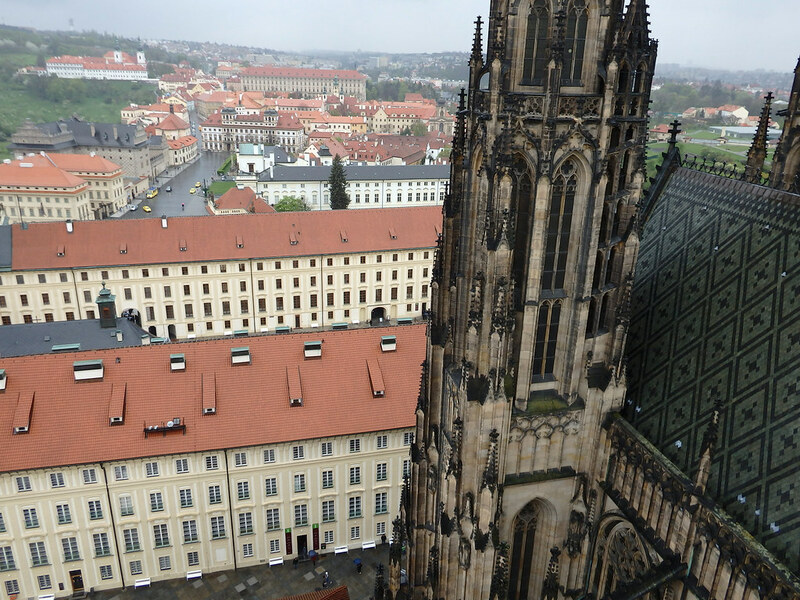 St. Vitus is one of the best examples of Gothic architecture in Prague and whose silhouette creates the iconic skyline when looking up at Prague Castle from below. The name of the Cathedral is actually from St. Wenceslas himself. Saint Wenceslas had acquired a holy relic, the arm of St. Vitus, from Emperor Henry I. Since Saint Vitus has a slightly Slavic name, he the Emperor thought this was the perfect relic to give to Wenceslas to convert the Slavic people to Christianity. Standing in the courtyard of the Cathedral, you are in the same spot where a Romanesque rotunda once stood in 924. Eventually, the old church was demolished to build St. Vitus. St. Vitus Cathedral was the crowning place of all the Kings of Bohemia and the resting place of St. Wenceslas himself. Take some time to wander around the church’s exterior. Spot all the gargoyles which hang over the roof, along with; dragons, scorpions and musicians. At night these creatures are all lit up from below, creating a haunting spectacle as their faces seem to move in the light. Like many of the great churches of the world, construction took ages. It began in 1344 but was not completed until 1929. Even today, the Cathedral is constantly being restored to ensure all the work that went into building such a gem isn't lost to time. The designer of the Cathedral was Frenchman Matthias of Arras who had previously designed the famed Papal Palace in Avignon. Matthias was responsible for the French Gothic style found so prominently in the Cathedral. You'll see flying buttresses, short transepts, five-bayed choirs and radiating chapels. Matthias of Arras was a schooled geometer and mathematician, who loved rigid, proportions. Everything shot up vertically, high up to the heavens. Matthias didn't live to see the Cathedral finished and after his death, 23-year-old Peter Parler took over construction. He was the son of the architect of the Heilig-Kreuz-Münster so, despite his age, he had much-lived experience from working with his father. Parler was an innovator and brought his own unique designs to the Cathedral. He synthesised traditional gothic elements and his modern ideas, exemplified in the vaults he designed for the choir. These now named "Parler" vaults, have diagonal ribs that span the width of the choir-bay giving them additional strength and also producing a dynamic pattern affect along the ceiling. Parler was a sculptor and woodcarver as well as an architect. When he took over the project, he moved away from the mathematical, structured designs of Matthias and added natural ornamentation. Study the tracery panels of the buttresses, window ornaments, the bell-shaped columns, passageway lintels and the busts in the triforium - each one given an artistic flourish that only a sculptor could have conceived. 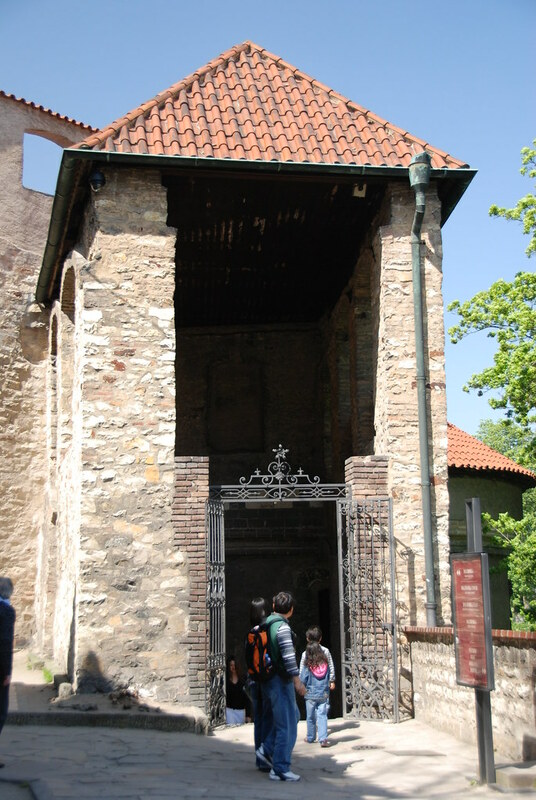 The most important area of the Cathedral is St. Wenceslas Chapel. Inside, relics of the Saint of Prague are still housed. The lower portions of the walls in here are decorated with over 1300 semi-precious stones and paintings depicting the Passion of Jesus from 1372–1373. In the corner of the room, you can see a small door with seven locks, leading to the 'Crown Chamber' which contains the precious Crown Jewels of the city. These jewels are off limits to the public, except for one day every eight years, when the seven locks are opened, and these incredible treasures can be looked upon by the people of the city. The last thing to make sure to gaze upon in here are the stained glass windows. The most important being created by Czech Art Nouveau painter Alfons Mucha. Created in the early 1930s, the piece was made for the millennium jubilee of St. Wenceslas. The window displays the young St. Wenceslas with his grandmother St. Ludmila. Surrounding the centre scene are smaller vignettes of the lives of Saints Cyril and Methodius who spread Christianity among the Slavs. The first thing you'll notice upon looking at this piece is the saturation of the colours and strong lines around the figures. With more modern technology in 1930 then many people had in the earlier years of stain glass production, Mucha was able to produce a more impactful piece of artwork. Alphonse Mucha's art nouveau stylings are prevalent in the look and feel of this window. Despite being locked into glass, there is still a flow to the piece with powerful organic forms blossoming in the panels. For those of you who have the courage and energy, be sure to climb the stairs up to the top of the tower to get some beautiful views of the city and courtyards below. After exiting the church, head across to the Royal Gardens. These contain an incredible display of fountains, manicured hedges and colourful flowers. The inside of the house which surrounds the garden has been turned into a gallery for art aficionados. To the east of the Cathedral, you'll find the place where the throne room of the old princes of Bohemia once stood. Now, in its place, stands an iron statue of St. George slaying the dragon - a memorial to the dead of the first World War. Adjacent to the statue is the Old Royal Palace. This building was first erected in the 9th century but has since been through various renovations. Although you can only view parts of the Palace, the grandest part of it is Vladislav Hall. This once was the place where the kings and queens of Prague hosted feasts, balls and large markets. 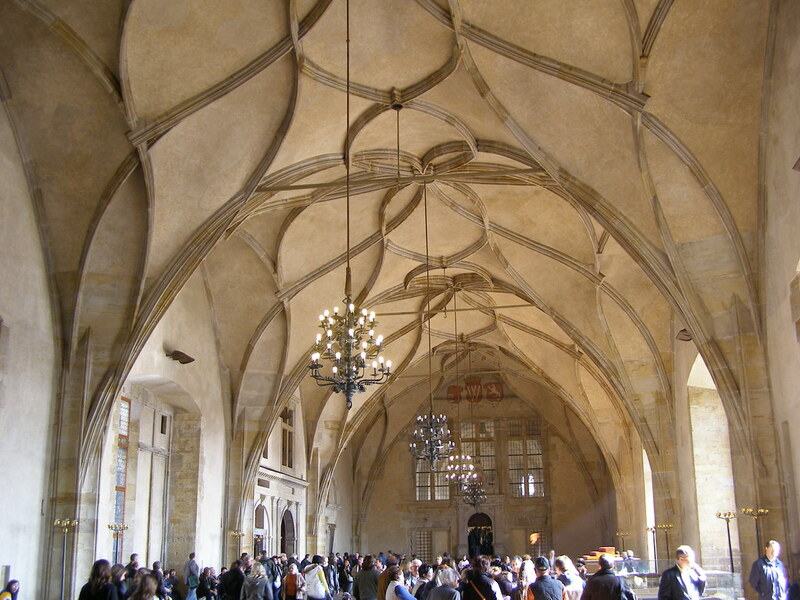 The vaulted, late gothic ceilings in this room are the only real ornamental left, but one can imagine the bright colours with would have flooded this hall when the tables cloth, velvet dresses and the colourful food was all laid out for the nobility. 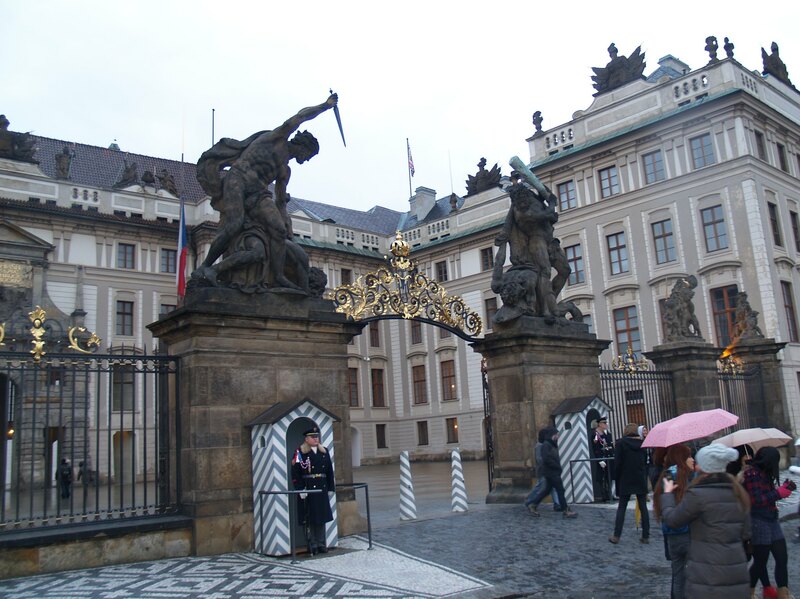 The palace also still holds the crown jewels of the empire, including the Czech Crown. There is a legend that anyone who dons the crown as a false king would die within a year. During WWII, during the Nazi occupation, Reinhard Hedrick did this very thing, and before the year was out, he was assassinated. Attached to the Old Palace is the New Royal Palace. This houses some of the most fantastically decorated halls in all of Prague. This building once served as the living quarters for the Kings and Queens and is today the residence of the president of the Czech Republic and his administration. Large, elegant receptions are held for diplomats and state representatives and it is only open to the public two days a year. After visiting the Old and New Palace, make your way over to St. George Basilica. St. George Basilica is the oldest surviving building in Prague Castle and the second oldest church in Prague. It was founded by Vratislaus I of Bohemia in 920 and dedicated to Saint George. The red, Baroque facade was added in the 17th century, but the original structure from the 1100's remains preserved inside. The ceiling is made of dark wood and only small, decorative windows dot the thick stone walls. It is a cool place to rest during a hot day, and it's stone seem to vibrate with history. In addition to being able to visit during the day, if you'd like to see it in the evening you can attend an evening classical concerts. The thick walls make for great acoustics and give guests an excellent introduction to some classic Czech composers. The final area to explore is the narrow street named The Golden Lane. The Golden Lane is a row of miniature houses built in the 16th century in the mannerism style of architecture. These served as home to the castle's servants. Although these little houses are now only home to touristy gift shops and miniature museums, try to spend your time studying the design and colours of the exterior of each house. Look up at the windows and tiny the roof tiles. 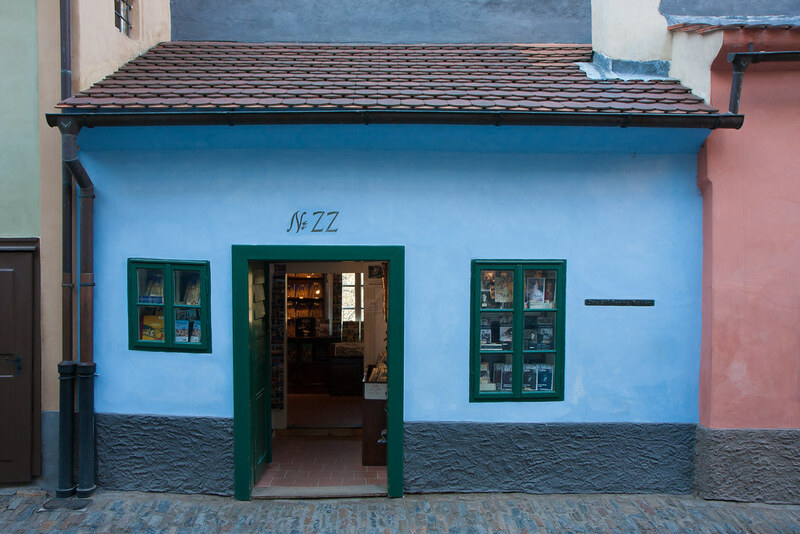 Also, don't miss House #22, the blue house, which was home to Franz Kafka. The street gets its name from the famous alchemist who once lived here during the reign of Rudolf II. This alchemist was obsessed with creating the philosopher's stone, the elixir of youth and most of all, trying to turn worthless metals into gold! He was never successful but his memory lived on. In the 20th century, an old doctor of philosophy spent his life savings collecting old books on magic and went about secret experiments in his house on Golden Lane. One day, neighbours heard an explosion and came running. His house was on fire, and when firefighters finally were able to extinguish the blaze, they found the old man dead inside, clutching a large piece of gold in his hand. Perhaps he finally accomplished what all those alchemists before him were attempting to do, as no one could understand how else he would have come to own such a large, expensive piece of gold. At the end of the Golden Lane, is the White Tower. This White Tower served as a prison for noblemen from the 1500s to 1700s. Although most of the crimes were for rioting and unpaid debts, one of the cruellest women in Czech history was also housed here after her arrest. Allegedly she murdered over 14 people and performed horrible acts of torture on her victims. The other tower at the end of Golden Lane is Daliborka Tower. This tower you can go inside and see some recreations of the torture chambers that were once hidden inside this picturesque lane. This tower was another prison used during the end of the 18th century. It was named after a young knight, Dalibor, who was sentenced to death and imprisoned in the tower's dungeon. When Dalibor was locked up inside the tower, waiting for his fate to be decided, he learned to play the violin. His playing was so beautiful and sad that people would come from all over the city to listen to him. They took pity on poor Dalibor and brought him gifts and food while he was imprisoned. The day he was sentenced to death, everyone knew he was dead when the music which had once graced the laneways of the castle was suddenly gone. 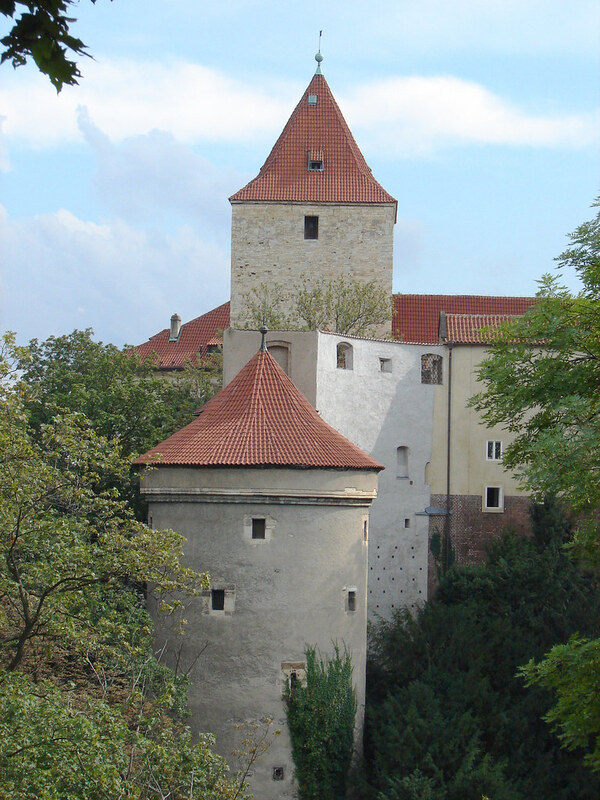 Dalibor was seen as a kind of 'Czech Robin Hood', and after his eventual capture, all prisoners to follow him into the Tower called it the Daliborka Tower. As you leave the castle, take a final look back at you exit, the small bridge you'll pass under before leaving the city provides the perfect frame for the candy coloured houses which line the road. Despite its overwhelming levels of tourists which come to visit, the sheer size and sprawl of the Castle mean you never to feel too overwhelmed. But get here early or late, and wandering this empty, medieval wonderland will feel like a dream come true.